I enjoyed a lovely heap of ribbon spaghetti here in the studio yesterday as I put together the last of the kits. Delicious! I was having so much fun playing with these fabrics, that I had to sew something else up. Just folding and assembling was like dangling a golden carrot. 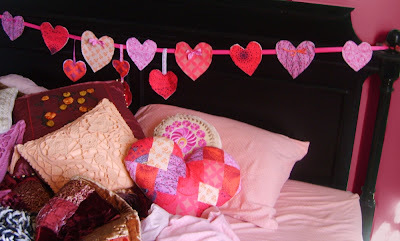 Our love-chain is romantically dangling across our bedframe currently. I am a pillow addict. My husband just proposed that we put the pillows in "storage" in the attic or something, because our bed is never made and they end up all over, just causing more clutter. Can you imagine? And he was totally serious. I was like uhhh-right. He may not suggest that if he knew those pillows cost more than most of the furniture in our house. Eh-hem. But no need to start that conversation. Instead I thought I would make another one. But this is no ordinary pillow. This, my darlings, is a love letter pillow. 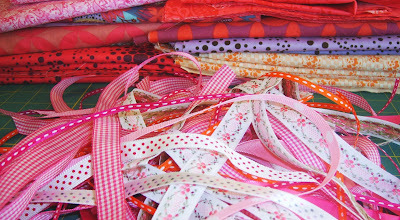 It is all funky pieced in the front with kit scraps and the back has an "envelope" for leaving sweet thoughts...or a grocery list. I'll be leaving a note for my sweetie..something about how much I love him blah blah and how sweet he is to put up with my blah blah bright colors blah endless making blah blah, but how waking up next to him (in a sea of pillows) is the greatest joy of my life, blabity-blah. Love, me. You kit-customers out there will be getting your love-chain-to-be very soon. They are all ready for shipping (UK and Canada be patient, please, you're great!). But I hope all will be inspired to make a little love letter pillow for yourself or your sweeties, little and big. Oh I just ADORE the pillow with the envelope pocket! As for paint, we just recently had to repaint our daughters room, it was that dark pinky color and even though the color suits her, it made her room feel small and dark and it seemed to glow in the dark--and the daytime. Funny Post AM. I love the cushion but did your DH enjoy finding another cushion on the bed? I am so glad you posted that pillow. I want to write that down for an idea for my girls! I would love to make them a heart pillow (maybe I can make my son a truck pillow with a heart on the back?) for V-day and leave them little "I love you" letters from time to time! You are so funny! I laughed out loud at this post. Thanks for the very big grin! I'm looking forward to seeing you next week and meeting Jeff. Hi dear Heather-yes I've been tinkering around lately with the blog design, I'm a slow learner, just figuring out how to add a snitch here and there to customize. But glad you like my new home! My husband & I roared over this post as I read it aloud to him. I am a fellow pillow addict. We checked out an old Steve Martin movie, Mixed Nuts, from the library. In one scene, some men are discussing their wives/g.f. 's obsession with pillows. BTW I noticed that your bed still wasn't made for the photo, just the pillows artfully arranged! For shame! Leslie-I remember that part of the movie! My husband so does not think I am funny, but would be glad to know that people can relate to his strife/wife. Make the bed? Are you kidding? Too funny Anna! We've had the same "conversation" over here! Get rid of my pillows??? No way! Of course your new envelope pillow is adorable!!! Wonderful idea! i made some like these a few years ago for everyone in our family and it has been so much fun to write notes to each other. one year my husband even bought personalized stationery for his notes.. it was shocking. :D You crack me up!